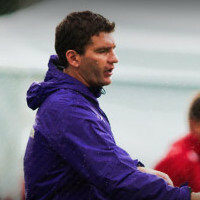 Jamie Clark is a graduate of Stanford University and has been a Head Coach in college soccer at Harvard, Creighton University and now the University of Washington. "He was always very much a coach on the field when he played," the elder Clark said of his son. "But we never talked about it as a career path. He just kind of fell into it." Now his son has fallen into the most vibrant soccer community in the United States. He's the leader of UW's tradition-filled program, and turned a Huskies team that uncharacteristically missed four consecutive NCAA tournaments before his arrival into one of the top programs in the country. The Dawgs have now made three-straight NCAA Tournaments, including an Elite Eight and Sweet 16 run, while also achieving a No. 1 National Ranking in 2014. Jamie Clark began his presentation with a trip down memory lane to Zimbabwe, where he and his family lived in 1984 and 1985 while his dad, Bobby Clark, was coaching the Highlanders soccer team. He thanked Rotary for helping his brother, Tommy, return to Zimbabwe 11 years later to coach soccer, which was a life-changing experience. When Tommy returned to Zimbabwe, he was shocked to learn that 25% of the kids he knew had passed away from diseases like HIV, which moved him to ultimately change his major from English and become a physician. Jamie was amusing when he kiddingly told us the role of the Washington Husky men’s soccer team was to spend a fraction of the money that is generated from football. In reality, his mission is to produce a team that the region can be proud of and youth can aspire to. Jamie’s role model is his Scottish father, who played in three World Cups and is now the head coach of the University of Notre Dame men’s soccer team. Since his parents believed education was important, they insisted Jamie graduate from college before becoming a pro soccer player. He graduated from Stanford in 1999. Jamie’s goal is to maximize potential with growth. He believes the best thing that could happen to a team is winning and the worst thing is not learning. As a coach, it is important to understand talents and as a player, you need to appreciate what you’re good at. As a coach, Jamie wants to produce men with character who want to give back to the community. He hopes the community will better support UW athletic teams that aren’t football or basketball. The soccer season starts with UW playing Gonzaga on August 28. When a question was asked about how recruiting soccer players is different from recruiting football or basketball players, Jamie jokingly responded: “Less brown bags full of money.” In reality, recruiting soccer players is more localized. Jamie said, “We recruit kids we know well.” There is one player from Colorado but most of the others are from the Pacific Northwest. Paul Chapman called the meeting to order at 7:30am. 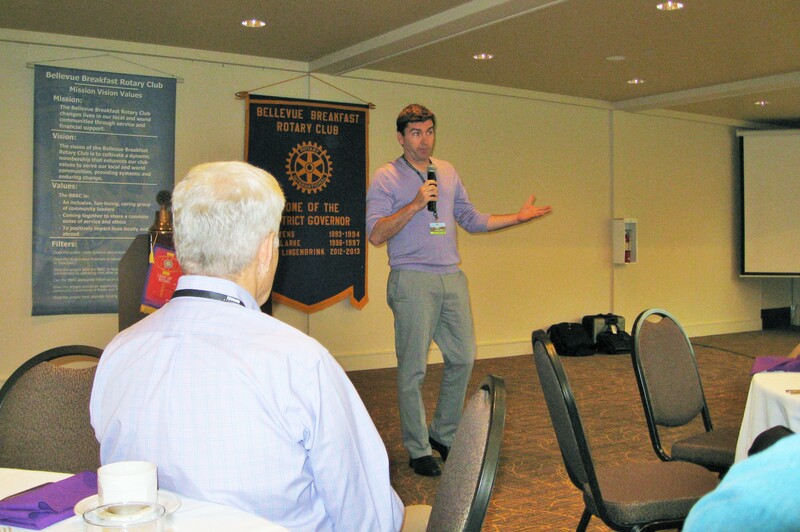 Jim Gordon introduced visiting Rotarians and guests. The Club needs more scribes. If you’re interested, contact Mark Hough at mark.hough@comcast.net. If you have changed careers, please let Paul know and he will put you on the agenda for a re-classification talk. If you haven’t already, please sign up for at least two committees. Alex is a dual American-Swiss citizen and has an international family. Her mother works for the World Health Organization in Cairo, her father lives in Miami and travels all over, one brother lives in the Congo and another travels back and forth between New York and London. 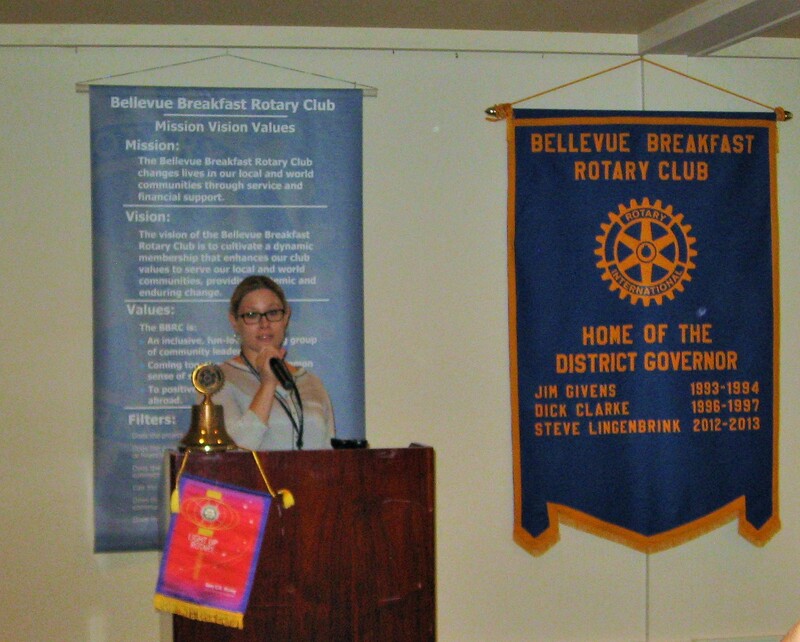 Her commitment to serving others began in high school, when she traveled to Tanzania to help build schools. Alex commented that the Tanzanians were some of the happiest people she had ever met even though they were very poor. Alex has been in the special education field for the past 13 years and now works at Northwest Behavioral Associates where she wears many hats, including working with autistic children and fundraising. Colleen Turner introduced Kara Cox and Caroline Lebeslourd, our summer exchange students. Kara recently spent four weeks with Caroline and her family in Laval, France and Caroline is here for four weeks staying with Kara and her family. Kara and Caroline created a fun PowerPoint presentation displaying photos of them in France and Washington. Kara noted the architecture is different in France, families always eat together, dinner is much later and people are better dressed. Kit Bowerman announced the Golf Committee is still looking for sponsors, donations, auction items and most importantly, golfers. We can’t very well have a golf tournament without golfers. Kit suggested travel destinations and sports memorabilia make great auction items. 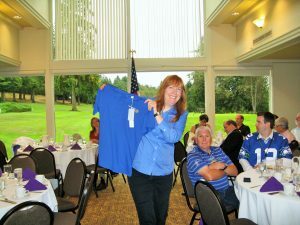 Ann Norman and Chris Boland promoted BBRC logo wear that can be ordered from Chris’s company, MerCom. You can order a dress shirt, polo or vest and proudly announce to the world that you’re a BBRC member. Contact Chris for more information at 425-503-3804 or chrisb@mercom.biz. Ann Norman announced there is a family fellowship event at Marina Park in downtown Kirkland on Thursday, August 20 from 5-7pm. Chuck Kimbrough announced that the BBRC Annual Adoption party will be held on Saturday, October 10. Mark your calendars.